Wife, mom of 2 teens, WRITER for parenting magazine, AUTHOR, screenwriter & HEALTHY LIVING enthusiast. I love laughing, sitcoms & my crazy family! 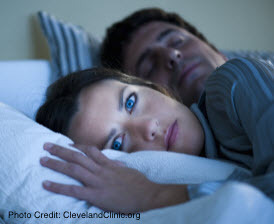 Most women will agree that your sleep cycle seems to change once you have had children. But how long can we blame the kids? Perhaps it really is just us? Yes, there are things (let's call them "data") that are constantly swirling around in my head at any given moment. There is my calendar, my husband's work schedule, my daughter's sports schedule, my son's school schedule and everything in between. Data is continually filling my brain and, as a result, I am left with very little room for anything else. This is where sleep comes into play. I cherish sleep. I need sleep; we all do. There are occasions, however, where all of that data is taking over my ability to sleep. I have no issues falling asleep but then... hello 2 AM. Two in the morning seems to be the typical time when my thoughts are jumbled, wriggling and spinning around aimlessly in my head. Ever since we started a family almost two decades ago, I have become the one responsible for keeping everything and everyone where they are supposed to be and without conflict engagements. I am responsible for the appointments, the work dinners, the swim-meet dates and lacrosse game schedule. Don't get me wrong; I love this job and I am good at it. However, although that information is neatly organized and color-coded in my actual calendar, it never seems like enough planning. I still get concerned that I am either forgetting something or screwing up someone's schedule. As luck would have it, this has become a catch-22 for me. My sleep is interrupted because I worry about those things. The catch-22 is that this thoroughness (yes, let's call it that rather than a tiny bit of OCD) makes me an extremely efficient person. Yet, I cope with broken sleep. I have truly overwhelming exhaustion by three in the afternoon and the compulsive desire to be in my pajamas by 6PM... or really maybe 4PM. I am unsure this vicious cycle can be broken. I have tried a plethora of methods to help "clear my thoughts" in the middle of the night. There is a pen and notepad nestled by my bedside. There are Post-It Notes waiting to be peeled away from their cube should a thought pop into my head. Of course all of this is done in complete darkness. Light is the enemy if you think there is even a remote possibility of falling back asleep. Come morning, it is sheer hilarity attempting to decipher my scribble. And so, here I remain. Over the years I have come to terms with this unfortunate cycle. This is, after all, the very misfortune that heightens my ability to be an extremely efficient and (hopefully) fantastic wife and mom. Even with the lack of a restful sleep, I am surprisingly not grumpy. I merely go about my day and hope that tonight will be the night that I sleep well. I am sure it is bound to happen one of these nights.